Entire contents are copyright © 2011 Keith Waits. All rights reserved. Standing l to r: Mike Fryman, Patrick Brophy & Joe Hatfield. Photo courtesy of Pandora Productions. Think of your most favorite Christmas fable and it almost certainly is a combination of innocence, fantasy, and music, with just enough schmaltz to melt the hearts of any curmudgeons on hand. So the first curiosity about Gays in Toyland is how closely it adheres to the formula for holiday enchantment. One might easily assume by the title alone that we are in for a nontraditional holiday offering that might even seek to subvert genre conventions and explode the very concept of the fantasy Christmas story. But the sly script by Jim Hesselman skillfully incorporates a message against intolerance towards gays while delivering a wholly charming and fully satisfying musical comedy that turns out to be, no kidding, entertainment suitable for the whole family. Whether or not those are the creator’s intentions, I would have no problem recommending this production for children, with only a few off-color or suggestive bon mots that would be readily acceptable for broadcast during the “family hour” of 8 to 10 p.m. The story of a gentle shopkeeper trying, against great odds, to make a go of a small toy shop that eschews modern technology for old-fashioned dolls is pretty “safe” material for children. Add burgeoning friendships, a couple of wayward elves formerly employed at Santa’s workshop, and toys that come to life to sing sweet holiday songs, and it all seems irresistible. 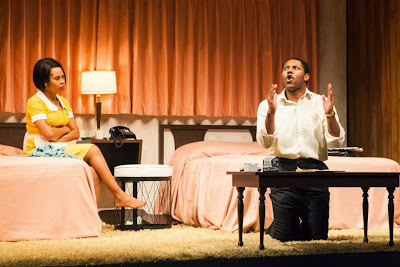 That the burgeoning friendships are framed as the beginnings of a romance between two men, and that the catalyst for much of the positive effect on the shop’s fortunes is a heroic transgender character named Noelle – are but two examples of the contemporary sensibility that is injected into the material. Yet the storybook quality of the text, reinforced with estimable skill in the staging, establishes a sturdy foundation that allows Gays in Toyland to stand beside Rudolph the Red-Nosed Reindeer or Frosty the Snowman as worthwhile seasonal fare. The whole enterprise moves at a spritely pace and, clocking in at a lean and economical one hour and forty-five minutes with intermission, exits the stage long before any welcome is worn out. 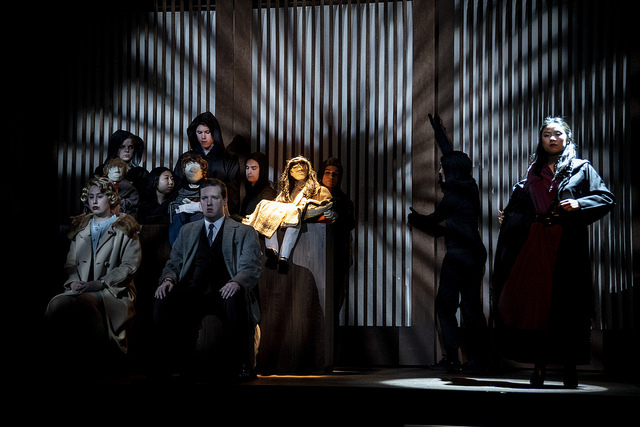 The cast is uniformly excellent and brings an appropriate light touch to the playing. Patrick Brophy was in fine voice and sassy form as Noelle, while Mike Fryman and Joseph Hatfield proved an appealing pair as the shop owner and his new employee/possible love interest. Jason Cooper and Kate Holland were a comic delight as the two elves, and Alex Craig, Susan Crocker, Laura Ellis, Robbie Lewis and Julie Zelinski all do yeoman service as the ensemble. The mix of classic songs with revamped lyrics is a crucial ingredient in the balance of tradition and modern sensibility. Some of the numbers are brief, mere snatches of song, but “All I Want for Christmas Is a One-Night Stand” was a full-fledged show-stopper that begged for a fuller accompaniment than could be provided by one keyboardist, even one as capable as Doug Jones. In the second act, a wonderfully affecting presentation of “Doll on a Music Box/Truly Scrumptious” by a quartet of life-size toys come to life (Ms. Ellis, Ms. Crocker, Mr. Craig and Mr. Lewis) was a sweet but complex and intelligent number that was simultaneously innocent enough for children but, at least in this context and with the help of Mr. Hesselman’s tweaked words, provided smart social commentary for the adults. Along with a humorous variation of “Baby, It’s Cold Outside” by the same four actors portraying newly baked ginger-bread cookies liberated from the oven, it makes the most potent case for the ageless appeal of this particular show. This show is yet another example of the seemingly inexhaustible ingenuity that Pandora brings to bear in exercising their mission statement. Hugely entertaining yet never so strident as to bury the joy and fun, the audience is invited to have a good time while expanding its understanding and insight of the larger society and the diversity of its citizens. 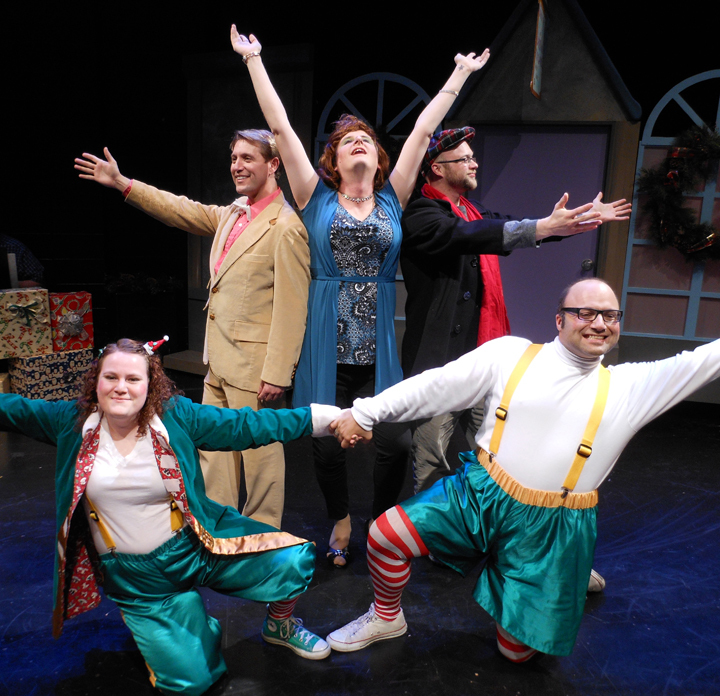 Unabashedly cute but also smart and sassy, Gays in Toyland is a winning addition to the parade of holiday productions.